On Sunday I decided Chicken Cordon Bleu should be my next 20 40 60 Fresh Food Fast cookbook recipe attempt. Chicken cordon bleu is one of hubby’s favorites. Additionally, Emeril presents an easy to prepare method along with the option of using common pantry ingredients. Easy, adaptable, and a family favorite characterize this Cordon Bleu as my kind of recipe. Don’t you just love perfect timing? The very same day I planned to prepare the chicken cordon bleu a package from Foodbuzz arrived. While wrestling with the premium packaging, I wondered if the family dinner plans were about to change. Lo and behold, not one but three bottles of Crisco Olive Oil were enclosed. Aaahh perfect timing, premium olive oil for this premium chicken recipe, thank you Foodbuzz and Crisco. Crisco provided this nice insert lending insight to the different varieties of olive oils and their relevant cooking functions. 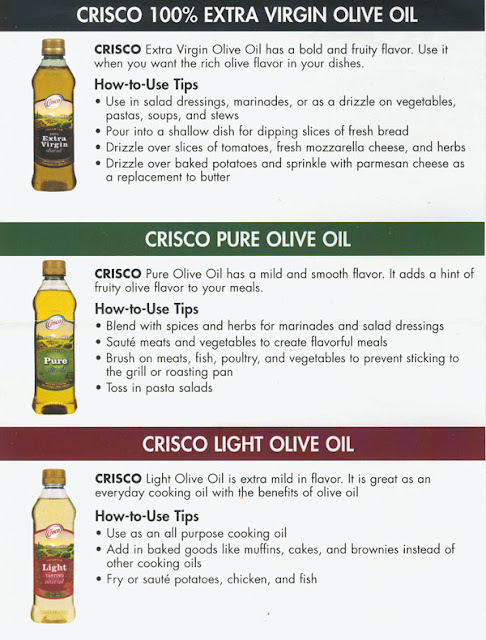 Crisco.com also offers recipes, a brief history on Olive Oil, and product specifications. Did you know the recommended storage life of an opened bottle of Olive Oil is 9 months? Cut each piece of chicken in half horizontally and place each piece between 2 sheets of plastic wrap. Using the smooth side of a meat mallet, pound out to a 1/4-inch thickness. Place the 8 chicken pieces on a baking sheet and sprinkle with salt and pepper. Divide cheese evenly between 4 pieces of chicken. Arrange prosciutto slices evenly over cheese; top with remaining 4 pieces of chicken. Tuck in any cheese or prosciutto that extends over the edges. Secure chicken pieces together using toothpicks along the edges to form a "sandwich." Place flour in a shallow dish; season with 1 tablespoon essence. In another shallow dish, mix together eggs and milk using a fork. Place bread crumbs in a third shallow dish; season with remaining 2 teaspoons Essence. Dip a chicken "sandwich" in flour, shaking off any excess. 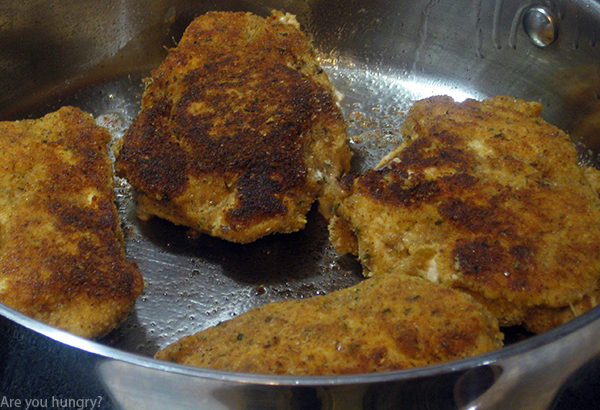 Dip chicken in egg mixture, followed by seasoned breadcrumbs; transfer to a plate. Repeat process with remaining chicken "sandwiches." Heat olive oil in a large skillet over medium-high heat. Place chicken "sandwiches" in skillet and cook, until browned on one side, about 4 minutes. Turn chicken and cook 2 minutes more. Transfer to prepared baking sheet and place in oven. 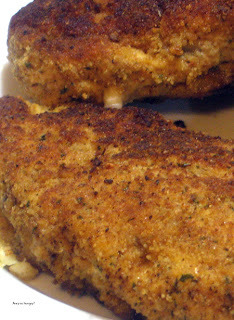 Cook until cheese is melted and bubbly and chicken is cooked through, about 4 minutes. Remove toothpicks and serve immediately. My changes were minimal, using ham instead of prosciutto and seasoned breadcrumbs rather than plain. Not only were these delicious but my first successful chicken cordon bleu recipe! Past recipe attempts proved to be messy, dry, and/or flavorless. The lack of difficult rolling techniques and/or the need to create tricky pockets in the chicken made the difference, in my opinion. The ingredients truly became one. The Crisco olive oil package afforded the proper selection thus providing full body flavor during the browning process, without a doubt. Hubby gave my dinner five stars and repeated his rating the next day. I have just one criticism; I could not remove the toothpicks. They were incorporated into the chicken, with some not visible at all. On the bright side, very little leaking of the cheese occurred and we simply removed them as we ate. Hubby, who wasn't bothered in the least by this, suggested buying large ones for next time. Guess he really did enjoy them!